Putting this potential spring run up to see if there is any interest for an overnight Viper Club Run to Solvang. In the past, we ran the Los Padres Forrest as a club one day event called the "Condor Run". An alternative one night stay in Solvang would be similar to the 1st half of the "Condor Run from Ojai to Hwy 166. Then a left on 166, The Cayucas Hwy, to a very nice winding canyon run at Tepusquet Rd. > Foxen Canyon > Los Olivos > Solvang. One night accommodations in Solvang with the afternoon shopping, lunch, wine tasting and an evening in the town. Home the following Sunday morning as individual travel. Here is the start location meet-up. Coffee Bean Westlake Village, off Westlake Village West from 101 North. Meet 7:00 AM on, plan on departing to Ojai around 8:30 AM, April 13th. Sounds great, count Ben and Lisa in! Whoa, Big Hitters in the T-Box. Just need the "World Famous Belvederes", and then the Vipers will come! I'll find some more later. We will take the left route as listed above. Those wanting to return back to LA the same day can come with us to Solvang and back the 101, or out through Frazier Park to the 5 and return. 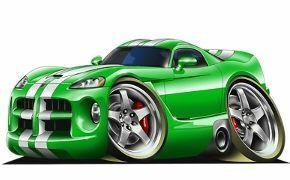 Maybe the President would float the run to Central Car Vipers for interest? Just booked a room at royal copenhagen but it’s a two night minimum so we will be staying until Monday. Jennifer and I are in. We miss seeing everyone. This looks like a great event. Thanks Eric! Count me IN Will try to get Madona to come With ! Once again, Harley has a track meet. Spring semester is so hard to get out. You guys have fun. Our website was recently updated to offer a new calendar feature, which allows our community members to suggest an event posting to our master calendar! 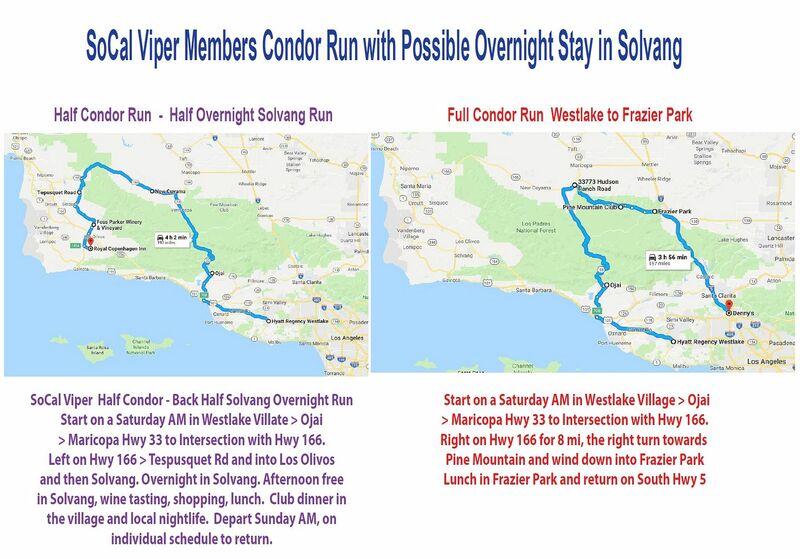 Information added to initial post concerning location of meeting place for Solvang overnight event April 13th, looking forward to this run through the Condor Reserve and the back way into Solvang. This sounds like a really fun run. Ruth and Nino are in. From what the guys have posted, we are booking our won hotel. Any thought to getting one with a special deal? Wadda ya think Lance?